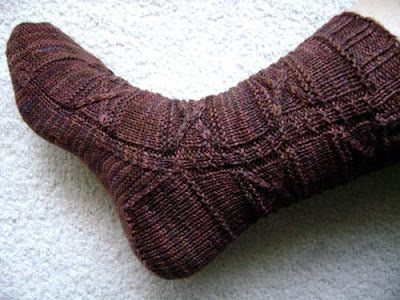 spillyjane knits: One more sock! So much for being uninspired by socks! I'd avoided them for months and now in just under 30 days I've banged out four new ones (now, to be fair, two were half-started and the other two were so much fun to knit I couldn't keep my hands off them. Anyway.) It's like I'm celebrating Sockvember over here. Too bad there's no such thing as Sockvember! In any event, much to my own astonishment, these fell off my needles yesterday: Yes, it's Trestle (Ravelry link.) Poor, neglected, and perennially ignored Trestle (you do recall the trestle they're named after, right?) I gave the pattern a (much-deserved) makeover which luckily was enough to catch my interest long enough to polish it off. The pattern should be out before the end of the month. I find myself wandering back into the realm of concept-mittens. You've been warned! As soon as there is something to see, I'll show you -- promise. I reeeeally like this one! I think it might be my favourite Spillysock so far! November 22, 2008 at 4:44 p.m.
Oh my crap, really? Thanks, lady! November 22, 2008 at 4:48 p.m.
Dude, Trestle looks like a million bucks! You really outdid yourself with this one. November 22, 2008 at 5:33 p.m.
Lovely pattern & I like the color of the yarn - so earthly! November 24, 2008 at 5:16 p.m.